SolarCity is a distributed energy provider that has grown fast and gone public on the promise of selling consumers cheap electricity. Since SolarCity (Nasdaq:SCTY) lowered its offering price to $8.00 per share last week, the stock has spent the last few days between $11.00 and $12.00 and is currently trading at $10.66 per share. 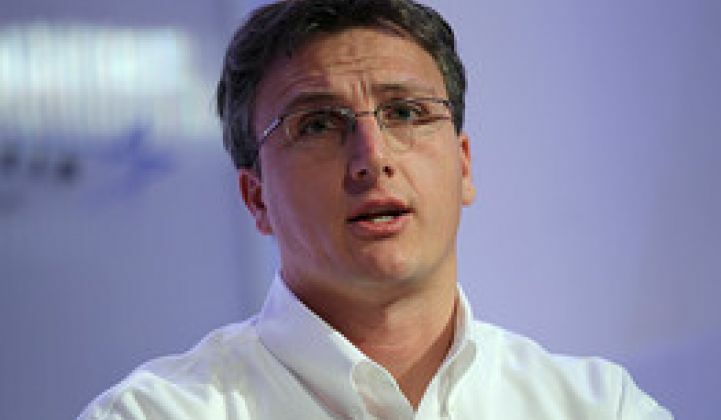 But to quote CEO Lyndon Rive from an earlier interview, "What matters is what the price is in four years, not what the price is today." We spoke with Rive today on this, the one-week anniversary of the firm's IPO. -"Once you get used to not sleeping, it's great. It does take a toll, but actually I think it's a very good process -- you get to meet 100 investors in a ten-day period. It's hard to match that." -"The reason why we ended up pricing at lower than the range was primarily because of the cleantech sector and the scars that investors have had in the cleantech sector. If you peel the onion even further and look in solar, the scars are very deep. They've heard many companies before us say, 'no, no, no -- we're different.' Now SolarCity is really different. But they've heard that before. So, they did not want to take a risk and in order to get them to be interested -- we had to give them a deal which was essentially at a large discount in a low-risk investment with big upside." -"We wrestled with it. Were we better off to go out or better off to do a private round? [...] The space that we're creating is so new; no one has done it, there are no comparable comps. The feedback from the investors was, 'Come up, let us understand your business over time, and grow with you over the next four years' -- versus coming back in a year and a half or two years later." -"There is no comparable company. Distributed energy generation is new. Historically, the solar industry has either been in the manufacturing side, in the installation side, or in the financing side. But those are all clearly different vertical businesses. Most of the publicly traded companies are in manufacturing, which hasn't been performing well at all. Margins have been severely compressed." -"There is no business that's an energy provider or a distributed energy provider. [We had] to educate investors on this -- that we're not an installer, we're not a financier. We sell energy and we create the energy at the place where you need it, and we sell energy at a lower rate than you can get from a utility. It's like saying that a utility company is an installer or a financier. They're going to do all the same stuff we have to do. They have to build up the infrastructure, finance it, and charge for a kilowatt-hour. We do exactly the same stuff." -"For the longest period, people used to call SolarCity the largest solar installer in the country. Argh. It would bug me. I would grind my teeth when I hear that." Rive also said, "Installing solar is a means to actually deliver the energy. We're not an installer. We're actually not a financier. Often I hear, 'SolarCity, the solar leasing company.' No -- we sell energy. And financing is just part of the product in order to get energy on the roof." Rive speaks about the Treasury investigation of 1603 financing, SolarCity's energy efficiency business, and underwater hockey in Part 2, to be published tomorrow.